I know, I know... it's been a little while since a post. I'm in the middle of a custom built-in project for a client and have been a bit consumed. I'll have before and after photos of that project coming soon! I was working in the garage this morning and I started to think of my tools and projects I can't live without. Glaze quickly came to mind. I LOVE glaze. Its so versatile and forgiving! If you're not familiar with this product, glaze is simply a translucent, typically water-based medium that can be used to create numerous effects on almost any surface. Glaze is also used in "faux bois" or creating faux wood-graining techniques. Currently, in my garage I'm using this glaze medium. I don't love it. 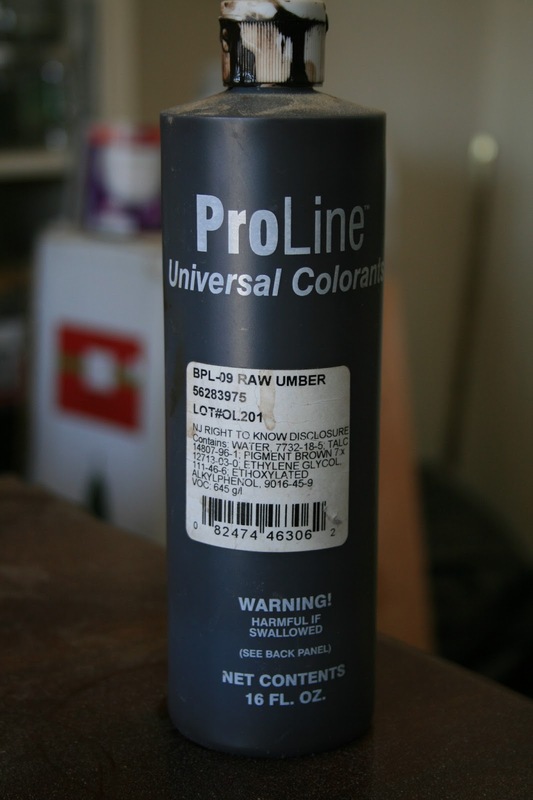 In fact, it is my least favorite of the three brands of glaze I've used. It has a weird, thick, snot-like texture and it dries too quickly. I really like both Valspar's and Behr's glazing medium. 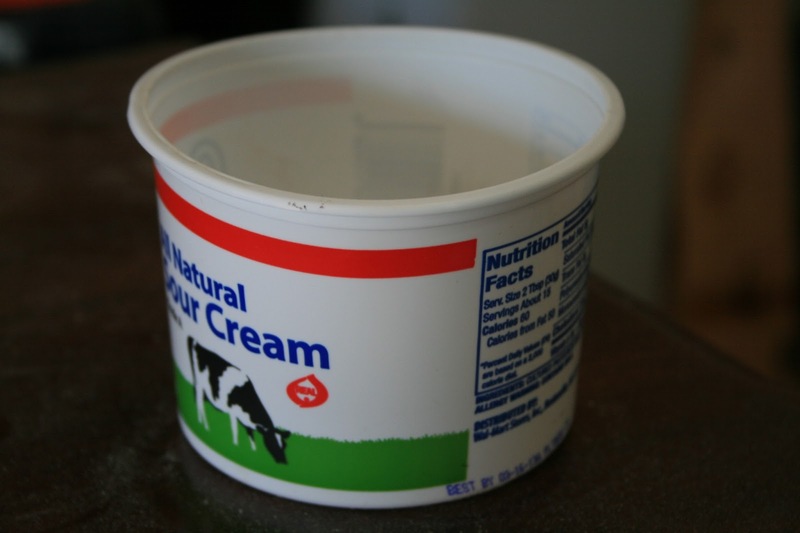 To mix the glaze, Open the glaze can and pour some glaze into your container. Add a small amount of tint and/or paint. Use a paint stir-stick, or pencil or whatever to stir the mixture until it reaches the desired translucency and consistency. 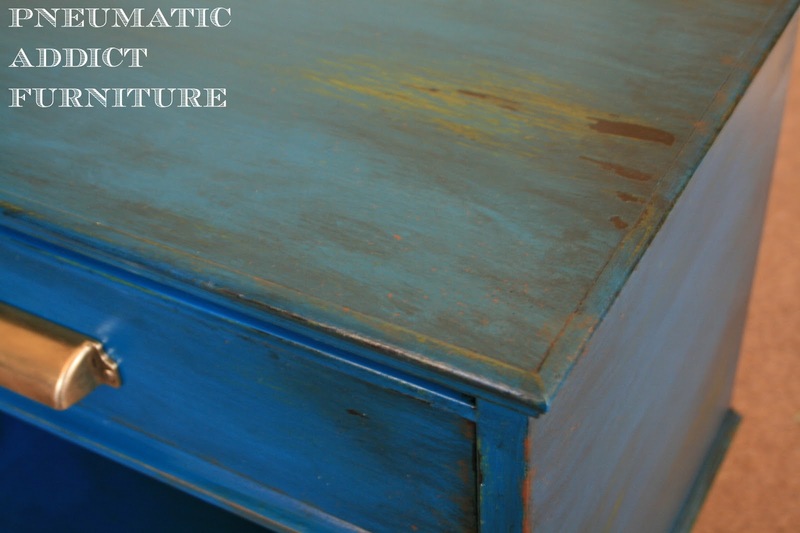 Test glaze on a scrap piece of wood to make sure you have your desired result. 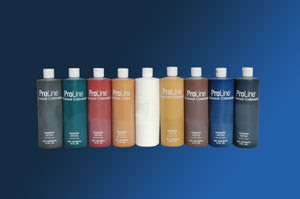 You can buy pre-mixed glaze in a variety of colors, but I ALWAYS custom mix mine. Depending on the look and opacity I'm going for (how opaque I want the glaze) I'll use either liquid Universal Tint, and/or acrylic paint. You can use powdered pigments as well. I never have, but I'm itching to try it. This is my standard glaze-mixing vessel. Classy, I know. Another nice thing about glaze is that it doesn't require fancy brushes or equipment. Often, a good 'ole chip brush will spread the glaze just fine. 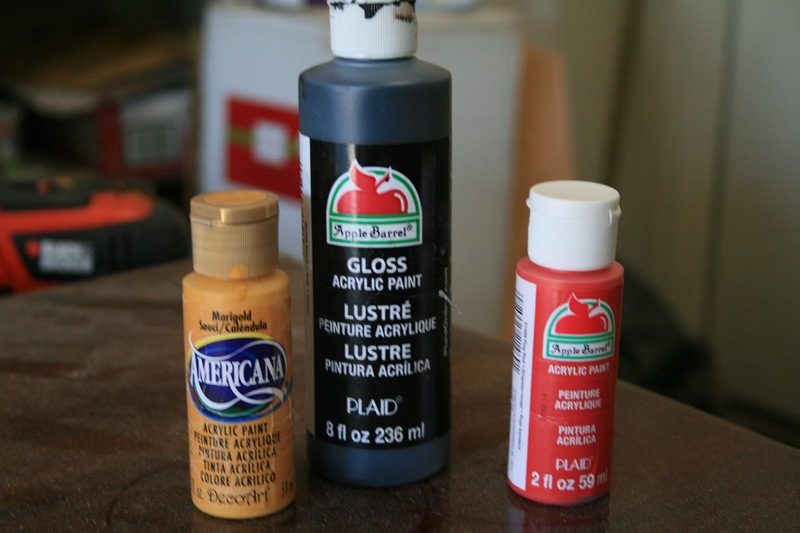 My go-to antiquing glaze always involves Raw Umber Universal Tint, and depending on the desired color, either light brown or black acrylic paint. Raw Umber is a dark, cool, brown. A bottle of tint this size is pretty cheap, versatile, and will last you FOREVER! One day I'll stop being so cheap/broke and pony up for a full set like this one. That would make life so great! If I'm applying over a light color, or just want to lightly accent the details, I'll blend a weak mix of tint and glaze. 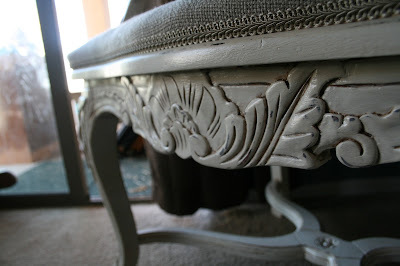 Glaze goes really far, so on a medium sized piece of furniture I may use 1/2 cup of glaze. So a weak mix would be 1/2 cup glaze and maybe 1/4 teaspoon of tint. 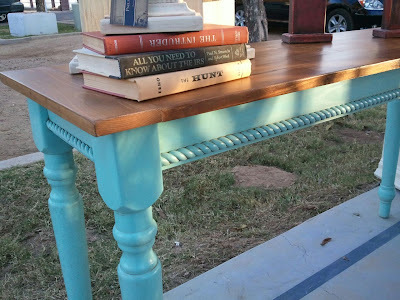 Like I used on the Rope Trim Console Table. The strongest blend I mix is when I want almost a black finish. For that I mix 1/2 cup glaze with 1 teaspoon raw umber tint and 2 table spoons black acylic paint. I almost never mix straight black tint. When using paint, black tint looks too fake for me. 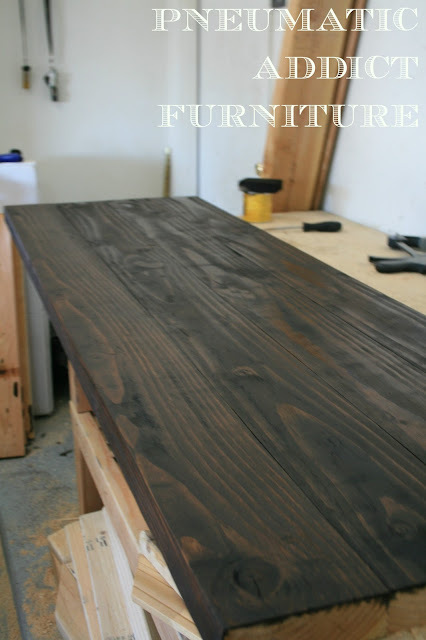 I like when a piece looks like it aged naturally, not like you smeared black paint all over it. The dark blend I used looks black, but just not as harsh. I often use glaze to slightly cover the harsh wood grain of pine, especially if I use a dark stain. 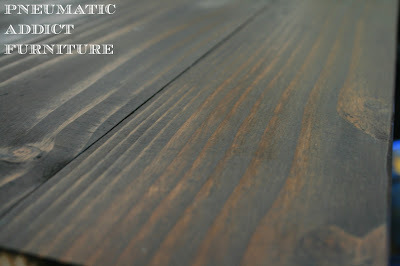 Some people love the "rustic" look of heavily grained pine. Its not really my thing, but I'm not about to shell out 5 x's the price to get a different species of wood. Take this bench top I'm working on for example. After wood conditioner and 2 coats of Minwax "Dark Walnut" it was pretty streaky. Something like this. Here's the arsenal I used, plus some Raw Umber. After two coats of glaze (wiping the first and leaving the second to dry) it now looks like this. 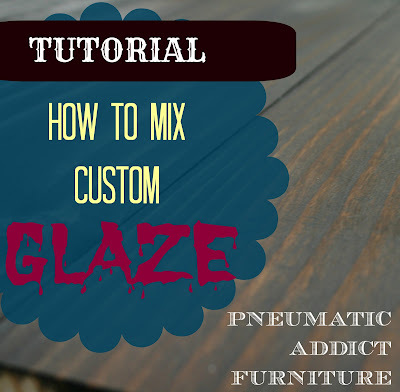 When Mixing glaze, it helps to have a basic knowledge of the color wheel and know what colors neutralize each other. I've been a hairstylist for 9 years and specialized in color for 2 years. 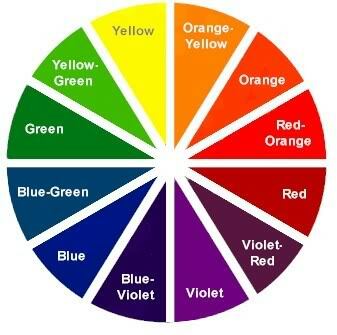 I got to know the color wheel REALLY well. I could lecture you on tones and tertiary colors, etc, but you really just need to know the basics. Look at the wheel. The colors across from each other cancel each other out. Red- green, blue-orange, yellow- purple. So when you get your highlights and your stylist says she's going to "tone" your hair and is holding something purple, now you know she is just canceling any yellow. Or when you stain a beautiful oak table top and it looks orange-y, now you'll know how to fix it. I recommend using acrylic paint to mix a toning glaze and start VERY weak. I also wouldn't recomend using the colors straight. 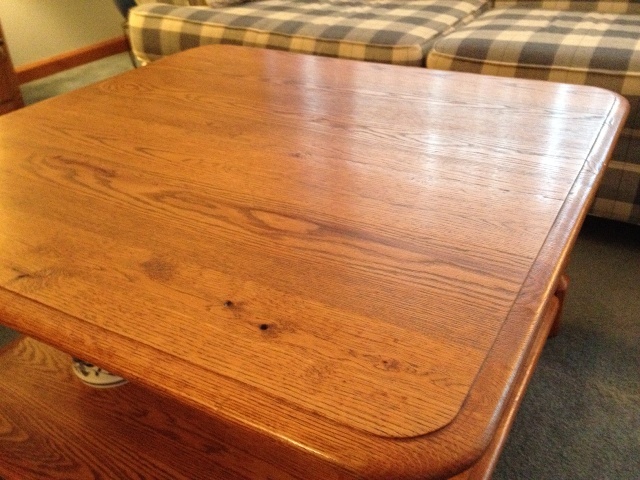 Look at your oak table top. It's not true orange, more like a orang-ish brown. So mix up a weak blue-ish brown glaze to neutralize it. 1. Start of mixing a weak batch. You can always add paint or tint and go over the area again, but it's more difficult to take away too-dark glaze. 2.Work quickly, and in small areas. Different brands of glaze have different drying or "workable" times. 3. 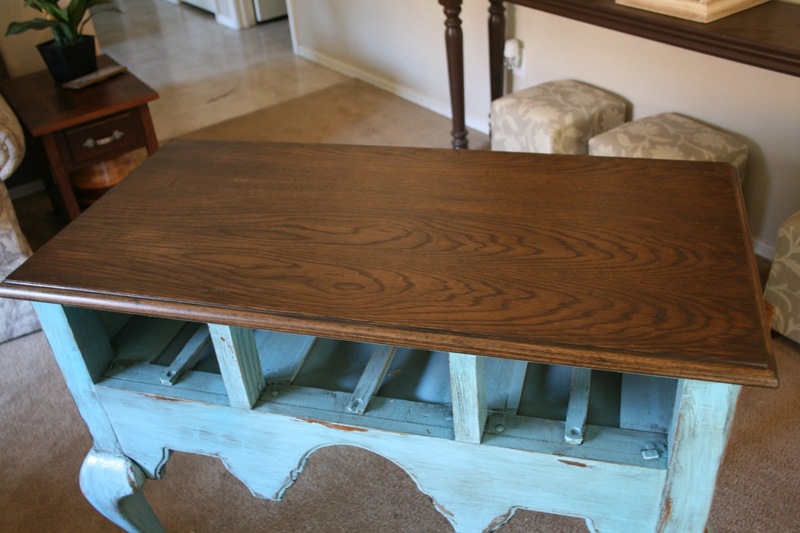 Make sure your paint or stain is VERY dry before applying glaze, otherwise all the rubbing will make the paint lift. 4. 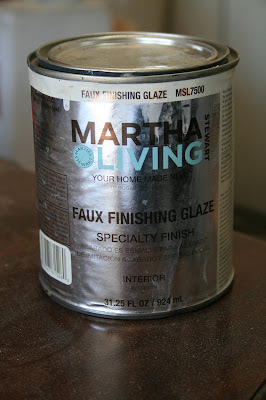 If you don't want your paint to absorb much of the glaze, use a higher sheen. For example, if I glazed over a semi-gloss paint, the glaze would slip right off the flat surfaces and just collect in the recesses. If I glaze over flat paint, the paint will absorb some of the glaze quickly and have more of the "dirty" look. That may be what you're going for. 5. If you are using a wiping glaze, make sure you have LOTS of clean rags around. If you are wiping with a saturated cloth, you won't remove enough glaze and the glazing will look uneven. 6. If the glaze does look too dark, or maybe just dried too fast in an area, don't panic. As soon as possible, grab some Floetrol and a clean rag, and rub off the dark areas. 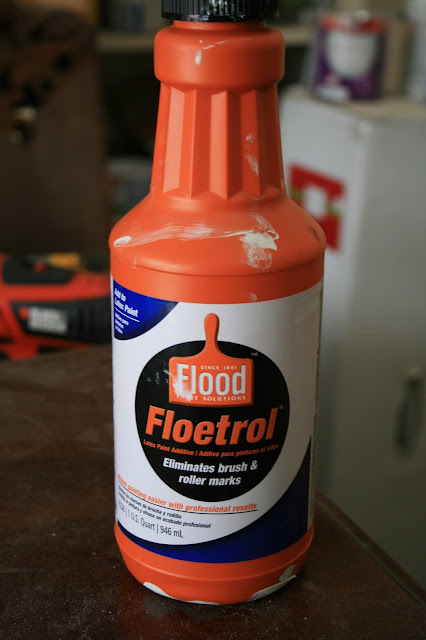 Floetrol is great for several applications, but I have discovered that it works great as kinda a "glaze eraser" on water-based glaze. Have any of you tried using glaze? Let me know what you've learned. I didn't even realize you could buy untinted glaze. 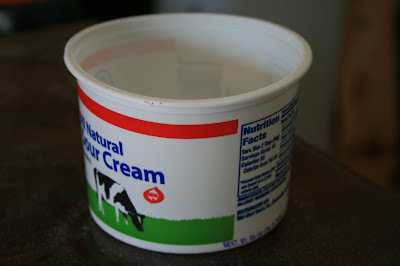 I have been using one gallon of Ralph Lauren glaze for like 5 years, and wondering what I will do when it runs out. Now I won't have to panic ;) Awesome info! It's been years since I've worked with glaze, thanks for the tutorial! Elisha, This post is a wealth of information on glaze. 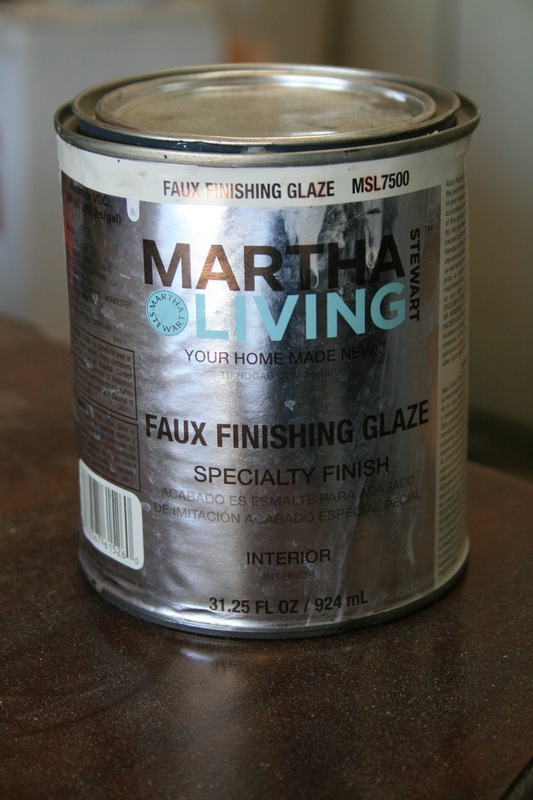 I have only used an antique glaze, so i found this very helpful. Thanks for linking up to Talkin’ About Thursday link party. I hope you will come back next week too! any other creatures that your child can imagine. Superb blog you have here but I was curious if you knew of any discussion boards that cover the same topics talked about in this article? I'd really love to be a part of online community where I can get responses from other experienced individuals that share the same interest. If you have any suggestions, please let me know. Many thanks! I've listened to this a dozen or more times and still find it delightful and sooooo original in concept. Both the content and presentation of news are drastically different from what it used to be. I want to mention a part of the Prime Law (Twelve Visions Party) which is part of Neothink. allows you to make use of the offered jokes which means you won't need to worry about email viruses. Hi, after reading this remarkable article i am as well cheerful to share my know-how here with colleagues. click on any search engine like Yahoo or Google. Cabinets are one of the most visible elements of a kitchen. There's a multitude of styles on the market as usual, you're only limited by the depths of your pockets. 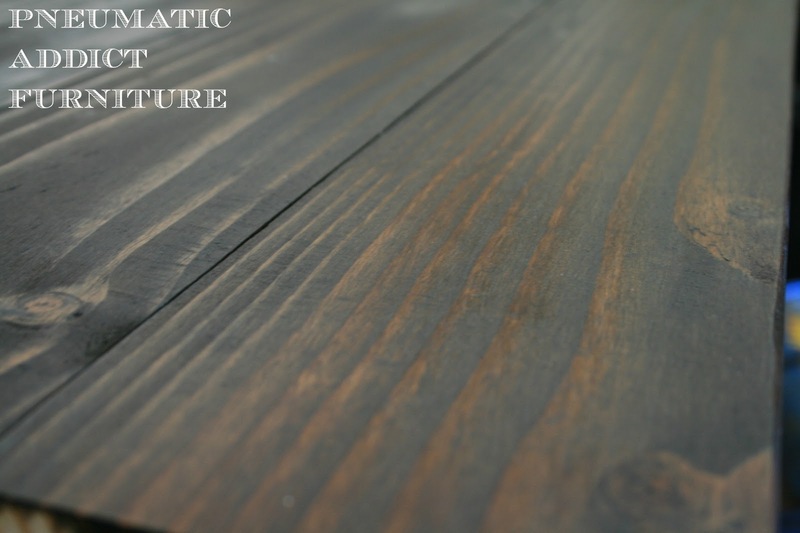 Cabinets can be split into three basic types, depending on quality of materials and finishes. Thank you for explaining the color wheel thing in English! I'm so insecure about colors on color. I'd love to tone down some pink in furniture, but j..u...s...t... don't dare! I really appreciate the pragmatic explanation! Thank you. It is very informative! In about 3 minutes I am going to attempt to make a black chrome spray that I want to use on some plastic parts that I have painted. Because I know I wont get it right the first time I am testing out the process on two separate pieces that I have painted; one with high gloss enamel black and the other is a reflective chrome finish. I want to either tint glaze a translucent black and spray over the chrome applying very thin coats like a mist with each coat drying before the next or somehow do the reversal over the gloss black. How would you go about using glaze to create a black chrome finish/appearance?